And it happened in the year of grace four hundred and sixty-six in the time of Leo the emperor, that the Venetians translated the body of St Mark from Alexandria to Venice in this manner. 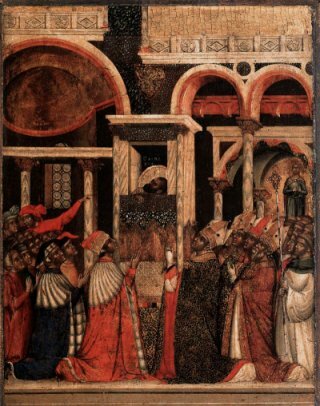 There were two merchants of Venice who did so much, by prayer and by their gifts, for two priests that kept the body of St Mark, that they allowed it to be borne secretly to their ship. And as they took it out of the tomb, there was so sweet an odour throughout all the city of Alexandria that all the people marvelled, though they did not know where it came from. Then the merchants brought it to the ship, and after setting sail, let other sailors know they were carrying the body of St Mark. There was one man in another ship that joked, and said: Are you sure you have St Mark? Maybe they gave you the body of an Egyptian! Then the ship where the holy body was, turned after him, and rudely boarded the ship of him that had said that word, and broke one of the sides of the ship, and would never leave it in peace till they had agreed that the body of St Mark was in the ship. Thus as they sailed fast before the wind, the air became dark and stormy, and they did not know where they were. Then St Mark appeared to a monk who was keeping watch on the body. He told him to lower their sails, for they were near land, and he did so, and soon they landed at an island. And all the natives they passed told them that they were happy that they carried so noble a treasure as the body of St Mark, and prayed that they would let them worship it. However, there was a sailor who did not believe that it was the body of St. Mark. But the devil entered into him, and tormented him so much so long that he could find on relief until he was brought to the holy body. As soon as he accepted that it was the body of St Mark, the wicked spirit departed, and from then he had great devotion to St Mark. Tintoretto's wonderful painting illustrates another legend. 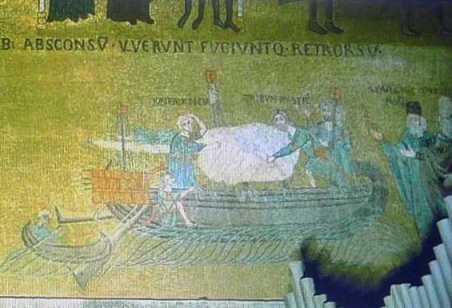 Following the martyrdom, the pagans were going to burn the body of St Mark on the bonfire we see behind him, but a thunderstorm intervened, allowing the Venetians to make off with the body. Of course, this telescoping of history makes no sense. And it's not just history that is taken liberties with. 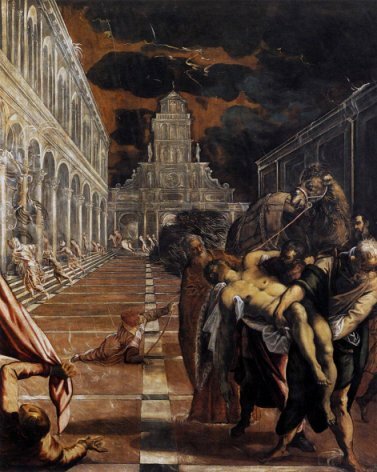 Tintoretto's Alexandria bears an uncanny resemblance to the Piazza San Marco as it was in his day, with the saint being carted off in the direction of the basilica. Only the camel suggests a more exotic location. An alternative view might be that the men in the picture are not the Venetians, but early Alexandrian Christians taking the body off for secret burial. 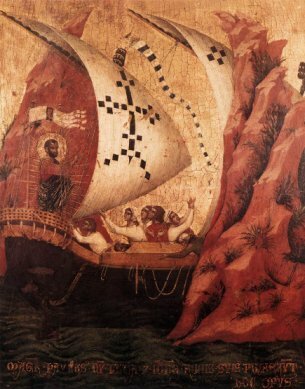 The ship with St Mark's body being searched by Muslims. As I have said elsewhere, politics and religion were tightly interwoven in Venice. Before St Mark arrived, the patron saint had been St Theodore of Amasea, definitely a B-list saint, and envious eyes were cast in the direction of Rome which could boast St Peter and St Paul. Even their maritime rival Amalfi had the relics of St Andrew. To have the relics of an important evangelist such as St. Mark hugely raised the status of the city. It would seem, though, that Buono and Rustico rather carelessly left St. Mark's head behind; The Coptic Church claims to have that in Saint Mark’s Coptic Orthodox Cathedral in Alexandria. The remains were reinterred in the crypt in 1094, but the regular flooding meant that this was no place for something so precious, and in 1811 they were moved to their present location in a sarcophagus under the high altar. According to accounts of the time, his head was included. Workmen, for their foolish pleasure, hewed off his head; and Launcelot Young, Master Glazier to her Majesty, feeling a sweet savour to come from thence, and seeing the same dried from all moisture, and yet the form remaining, with the hair of the head and beard red, brought it to London to his house in Wood Street, where for a time he kept it for the sweetness. John Stow, Survey of London, 1598.